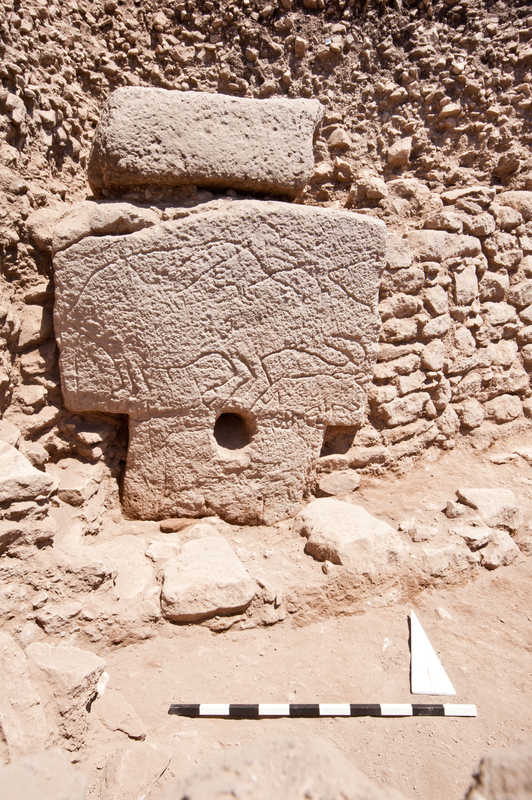 The most notable feature of Göbekli Tepe are, of course, the monumental circular enclosures formed of T-shaped pillars dating back to the 10th millennium BC. The first of these structures were discovered early druring excavations from 1995 onwards in the mound’s southwestern depression which meanwhile became known as ‘main excavation area’. To clarify if this peculiar type of architecture was limited to this part of the site and discovered by pure chance, geophysical surveys were undertaken – indeed demonstrating that similar features could be found in other parts of the mound as well. 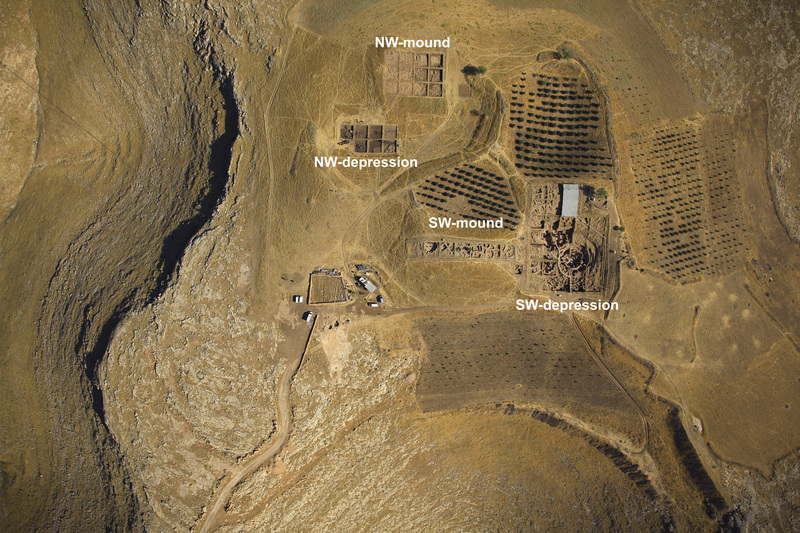 Renewed excavations in particular in the northwestern depression (Fig. 1) started in 2011 produced a number of interesting related features of which one, Enclosure H, should be in the focus of this short report. Georadar results already indicated a large, cloverleaf-shaped agglomeration of what seemed to be one or even more circular enclosures (Fig. 2). Excavations started in that area in 2011 soon revealed first T-pillars, confirming the existence of more monuments in this section of the tall as well. 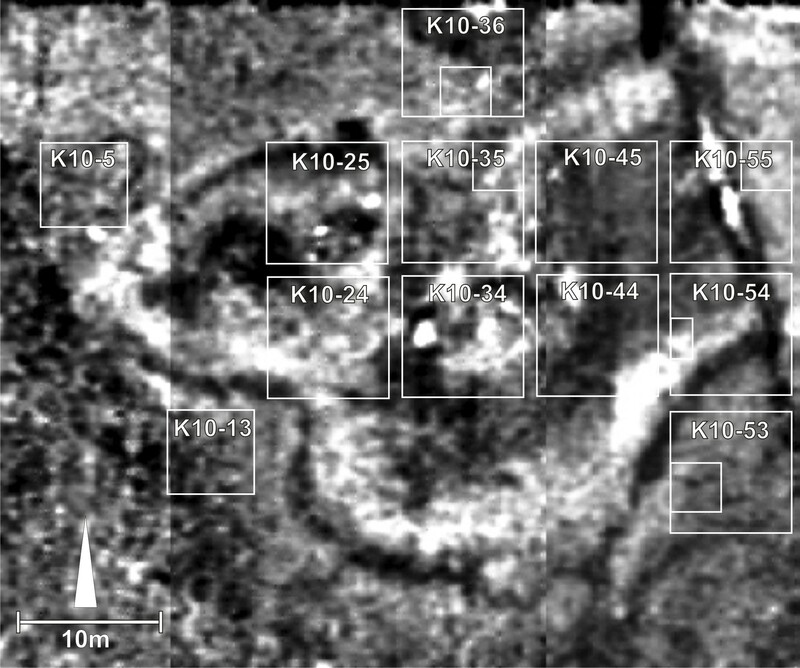 The structure which later would have been labelled ‘Enclosure H’ (in order of their discovery) could have been indeed located on the geophysical plan already as circular feature in the western part of the examined area (K10-24 and -25 as well as (partly) K10-35 and -35). 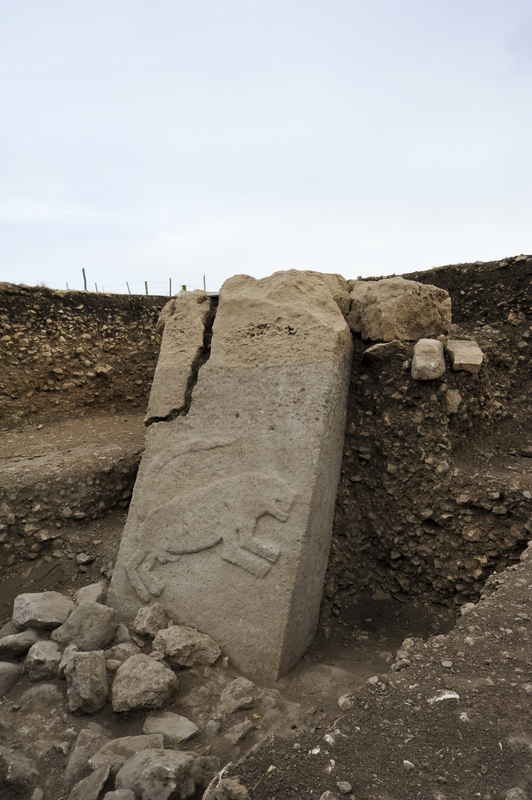 Although excavations are not completed yet, it can already be noted that it follows the general scheme and layout of the other known PPN A enclosures at Göbekli Tepe. In the course of following excavations eight pillars were discovered and excavated to this date (Fig. 3). 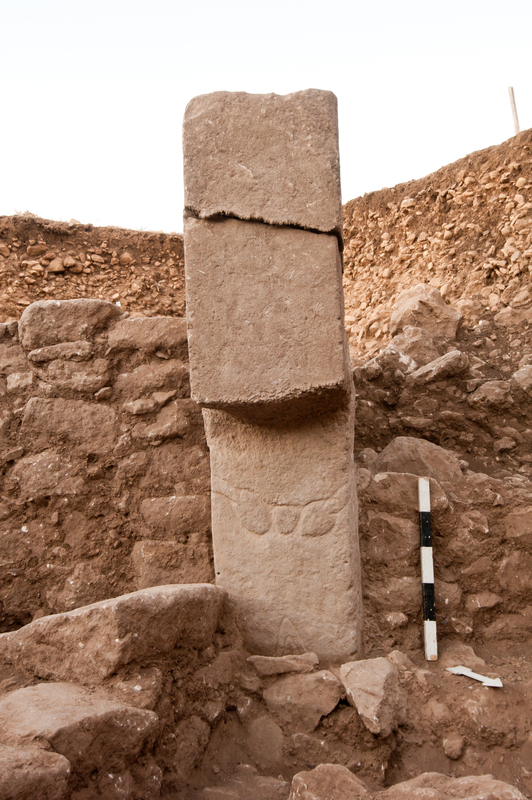 The eastern central pillar of Enclosure H, Pillar 51 (Fig. 4), was found close to the surface. While still in situ, the massive pillar was toppled over, its head heavily damaged (all fragments could be found and documented in immediate vicinity, however). The front side shows the characteristic stola-like depcition, the western broad side features the relief of a big cat which somehow resembles those animals known from the younger (Layer II) rectangular ‘lion pillars building’ in the main excavation area. Pillars 54 and 55 in the enclosure’s northern respectively southern wall are partly excavated, also showing the ‘stola’-relief. The latter’s head being damaged as well (most likely due to frost weathering). Pillar 56 (Fig. 5) is particularly notworthy due to its extensively decorated southwestern broadside – more than 55 animals are depicted so closely packed, that the outline of one merges with the contour of the next image. On the narrow front side a bucranium framed by two snaked can be seen. The northeastern broad side shows two very low lines which might indicate further reliefs here, but need to be clarified in the course of future excavations. Pillar 57 (Fig. 6) is situated in the southern wall of Enclosure H. Its head is, probably due to frost weathering again, damaged. The front side shows the reliefs of two snakes (whose bodies seem to wind around the pillar) are facing each other and a round object. Underneath another carving can be seen; hardly identifiable it could be another snake’s head. Of Pillar 64 there is only the basis left in situ, while another limestone fragment from its head was found nearby. Pillar 66 (Fig. 7) is situated to the west of P54 in the northern part of the enclosure wall, but deviates from the expected radial orientation since it stands almost parallel to the wall. This unusual position may have to do with a possible secondary use of the pillar here; something which was also already brought up for Enclosures B and C in the main excvation area. The pillar’s head depicts a large horned animal (maybe an aurochs or stag) with bent legs and hanging out tongue, maybe indicating the death of this animal. Pillar 69 (Fig. 8) in the northeastern enclosure wall shares the unusual orientation with P66, also standing parallel to the wall. Not completely excavated yet, it shows the relief of a jumping cat of prey on the shaft; the pillar’s head is smashed. The enclosure wall, which was unearthed in the southern and eastern as well, to some degree, documented in the northern parts, already can give an idea of the dimension of Enclosure H which probably was more of elliptic rather than circular shape and probably had an inner diameter of about 10 m. After a not yet determined period of use, the enclosure was finally backfilled and buried much like this could have been observed with the main excavation area’s enclosures already. 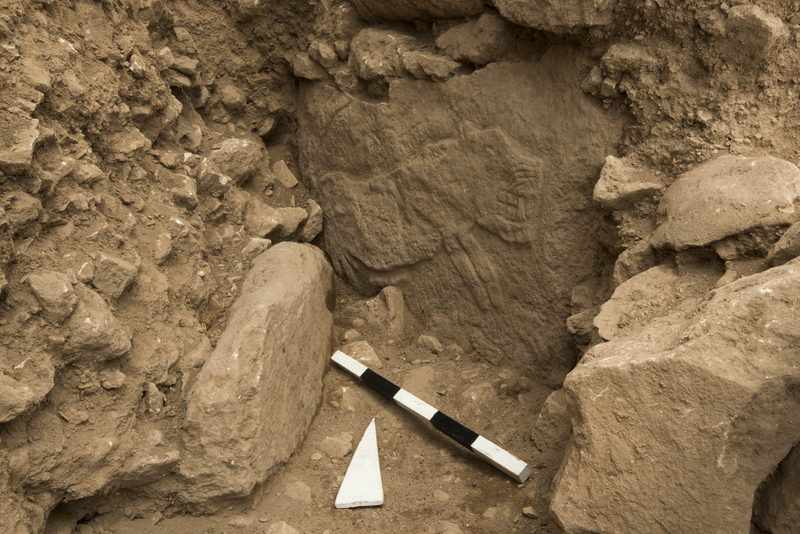 However, the excavated southern section of Enclosure H shows very clear that there must have been at least one additional later intervention after this backfilling took place. The alltogether rather ‘chaotic’ discovery situation of the southern enclosure wall, with broken stone benches and pillar fragments obviously not in their original position anymore, gives witness of this intrusion which can be also seen quite clearly in the northern profile of this excavation trench (Fig. 9). Interestingly, this somehow mirrors a similar situation already met in Enclosure C, where also a later dug pit which only purpose seems to have been locating and breaking the enclosure’s central pillars (whose smashed pieces could be retrieved nearby), for reasons still remaining in the dark as of yet. 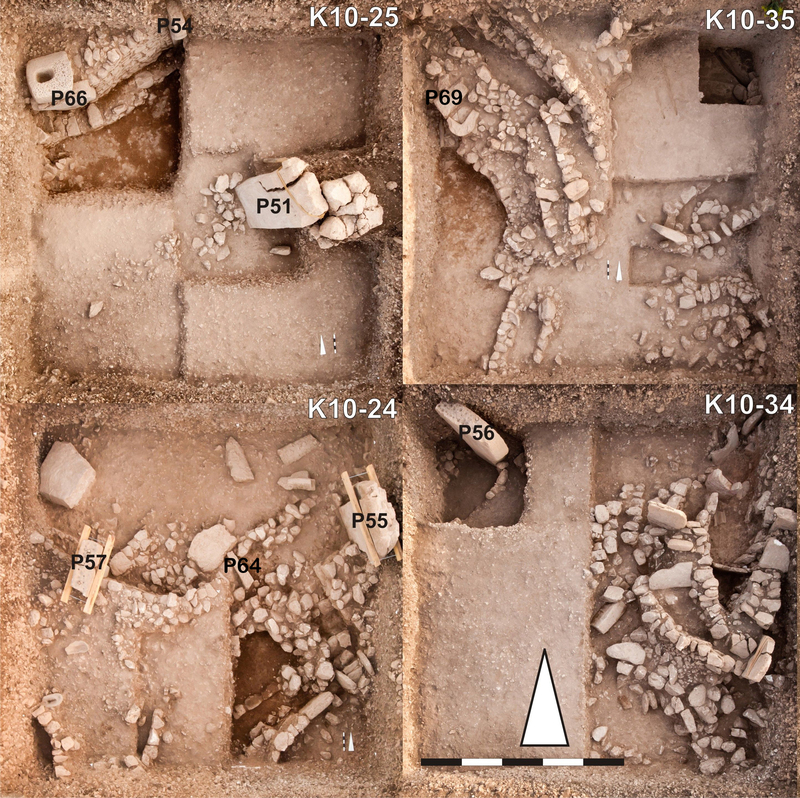 Another noteworthy feature (which again reminds of the general situation of Enclosure C) is the discovery of some steps apparently forming a stairway in the intersection of two walls in Enclosure H’s southern boundaries. If this really could be interpreted as some kind of entrance situation into the enclosure has to remain topic of future investigations here. O. Dietrich, J. Notroff, L. Clare, Ch. Hübner, Ç. Köksal-Schmidt, K. Schmidt, Göbekli Tepe, Anlage H. Ein Vorbericht beim Ausgrabungsstand von 2014, in: Ü. Yalcin (ed.) Anatolian Metal VII – Anatolien und seine Nachbarn vor 10.000 Jahren / Anatolia and Neighbours 10.000 years ago. Der Anschnitt, Beiheft 31, Bochum 2016, 53-69. Whatever their beliefs were, they clearly aroused great emotion and were strongly held for later disinterment and destruction to be undertaken. The destruction of religious icons/structures has continued to the present day.. There are no carbon data available for enclosure H. Have you an idea of the approximative date? Is it in layer III or II? Enclosure H belongs to layer III. Is there any opinion so far as to when C and H were dug up again? I know the weathering on the heads could be misleading. I’m guessing it’s possible the back-filling settled over time, and that could have exposed the tops, which would be difficult to work around I’m sure, but is there any material you’ll be trying to carbon date from the secondary filling, or does it all seem to be the re-used fill material contemporary with the original burial? Thanks! As of yet we cannot say for sure when this intrusion took place, but since the pit in Enclosure C was directed at the central pillars (which subsequently were heavily damaged in the course of this act) there still seems to have been some knowledge or idea about the enclosure’s structure or at least these central pillars. For those interested please see my paper on Pillar 51 related to its meaning as interpreted via ancient depicted sign language. I’m really curious about how much stock we can put into modern explanations of these ancient ruins. I have read your paper on pillar 51, and although I find it incredibly interesting and intriguing, I don’t understand how you can correlate, say, the U shape of the mouth to “a water source”, etc. I mean, why is it not more likely that the exact shape of the mouth relates more to the properties of the rock when carving? I am a writer, and I know that later interpretations of prose often bear no relationship to the meaning of the author when writing. I wonder how much of this we are imposing on the stones, rather than extrapolating from them? The above was done to avoid too much repetition in later papers. It is not the U shape of the Mouth that means, “a water source” but rather the Image of the Mouth that indicates, “a water source” (saliva). This is true of any depiction of a Mouth whether human, animal, or even the Mouth of a vessel. The U shape is the gesture sign for, “turning” at the water source. Turning places appear to be areas where the spirits of the deceased turn in direction. Sometimes a gesture sign might be in the position where a Mouth would normally be found. In such a case the gesture sign alludes to the Mouth. I try very hard to avoid imposing modern ideas on to depicted sign language. For the most part I try to avoid too much explanation and rather let the signs speak for themselves. The gesture signs are historically documented signs. The organizational structure of the depicted signing system is hardly modern and is quite difficult for a modern person to wrap their mind around. This is because it is based in animistic assumptions, as well as a non linear world view. The animal Imagery found in ancient compositions is not about the animals per se but rather addresses their spirit-essence as phrases related to their observable major characteristic behavior. This allows the system to incorporate complicated concepts that would be difficult using the gesture signs alone. For example the Maya “priests” spoke about (in the Popul Vuh), “those Foxes and Possums in the city.” This has created a bit of historical confusion as to exactly what they were referencing. But if the reader allows that these comments were intended to be sarcastic then one can understand that the Maya were speaking about the new puppet government instituted by the Spanish. Those Foxes, “those clever ones”, the Possums, “those pretenders”, (as Possums feign death when threatened). The idea that ancient cultures had so many “gods” as to tax the memory of even a modern person probably stems from the misinterpretation of the spirit essences. Ancient man, living close to nature, would understand such references to animal characteristics (Imagery). As far as the meaning of the signs go a thesaurus would probably be more valuable than a dictionary. Also, it is true that a researcher today cannot know all the associations that were in the mind of ancient man. We can only gain a glimpse of such meanings. I did not mean my interpretation of the signs to indicate that Gobekli Tepe marked a water source. There doesn’t appear to have been a natural artesian water source at Gobekli Tepe. The ancient cosmology appears to have been based on the water cycle and therefore the references to water sources. Gobekli Tepe may have been a construct based on the cosmology but not relying on a natural source of water. What role the cistern played in the cosmology is unclear. The lack of Mouth Imagery in some statues may reflect this. Gobekli Tepe probably served several purposes such as a cosmological center, a central meeting point for the culture, and a sort of council place for the heads of the various representatives of the clans or lineages. There is also the possibility of an astronomical aspect with some indication that the site was related to the Sun and Venus and the glorification of a warrior culture. “…a researcher today cannot know…” – ‘cannot’ is a too harsh word. Whenever somebody tells you that something cannot be done, that somebody is almost certainly wrong. History has proved that countless times. You are correct that the GT served several purposes, those that you mentioned, but that is still not enough to explain the persistent 2 millenia of use and operation, and especially not the preservation for posterity efforts, which are quite unique. Any hypotheses that tries to explain the GT, must explain the site’s durability. I say it was a library, with true stories cast in stone. “There is also the possibility of an astronomical aspect with some indication that the site was related to the Sun and Venus and the glorification of a warrior culture.” – I proved the astronomical aspect beyond doubt (the figures are groups of stars, etc…). Relation to Sun and Venus and glorification of warrior culture can be applied to Mayan monuments, but not to GT. GT people cared not of planets, only of stars, which includes the Sun however, and they were clearly not a warrior culture, but a cultural centre of sharing and cooperation at that time, a unique place in Neolithics, which abundant resources of that area provided. People from all over the Middle East gathered there on their annual feasts, to share, trade, marry, and learn. History has proven that in some cases but not all. In a sense Gobekli Tepe was a library of sorts. The signs on the pillars did preserve concepts important to the builders. In ancient times most of the men had to be warriors to protect their group from the threat of others. The signs from many ancient cultures indicate that they viewed Venus as a star. I can only interpret the signs and approximate what the mean. At this point in time I have found nothing that speaks to feasts, trade, and of marriage. Evidence for this must stem from other sources.